Pence’s speech to the Knesset praised Israel’s democracy, while Palestinian members of parliament were forcibly removed for expressing their views, says TRNN correspondent Shir Hever. SHARMINI PERIES: It’s The Real News Network. I’m Sharmini Peries coming to you from Baltimore. The US Vice President, Mike Pence, arrived in Israel on Sunday for a two day visit. Prime Minister Benjamin Netanyahu praised Pence as a great friend. 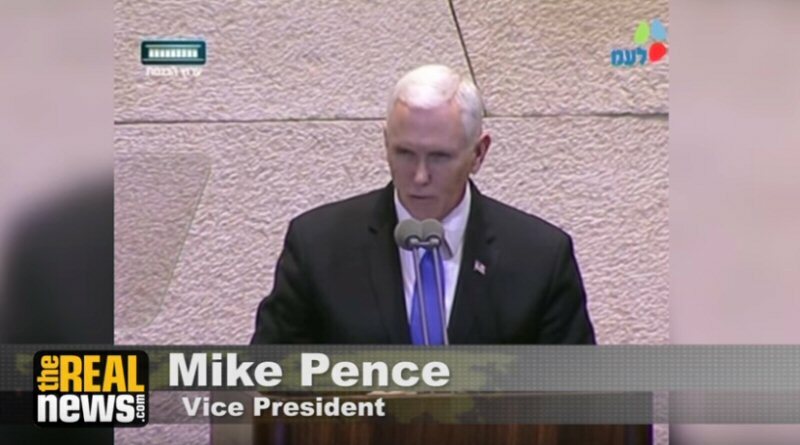 While speaking at the Knesset, Pence restated the US plans to move the US embassy to Jerusalem before the end of 2019. This stirred up some members of the Knesset. MIKE PENCE: It’s deeply humbling for me to stand before this vibrant democracy. In the weeks ahead our administration will advance its plan to open the United States embassy in Jerusalem and that United States embassy will open before the end of next year. SHARMINI PERIES: On to talk about this with me today is Shir Hever. Shir is our correspondent covering the Middle East, Israel and Palestine in particular. But he’s based in Heidelberg, Germany. Thank you so much for joining us today, Shir. SHIR HEVER: Thanks for having me, Sharmini. SHARMINI PERIES: So Shir, let’s start off with that particular statement at the very end of the speech Pence gave at the Knesset in Israel declaring that the US embassy will move to Jerusalem no later than the end of next year. What do you make of that statement and how was it received in the Knesset and beyond? SHIR HEVER: This statement comes from a very low key visit, actually. The Vice President Pence came to Israel not on large, official business and not as part of negotiating a peace deal between Palestinians and Israelis because the Palestinian government is boycotting him and refuses to meet with him. And he was only met by the Minister of Tourism at the airport. So, that was not a very big ceremony. But I think while for President Trump it was very important to mention this idea that Jerusalem should be seen as the capital of Israel, it was important for Pence to mention the issue with the embassy because of his own base, because of his own background within the United States. And he’s supported by various groups of right wing, born again, evangelical Christians and Christian Zionist organizations that have a very specific view about the Middle East and about what they would like to see in Israel-Palestine.His statement about the moving of the embassy is not something that. it was made despite of how divisive it is and how dangerous and explosive it would be to move the embassy from Tel Aviv to Jerusalem. It was done because it’s so divisive and explosive. It was done in order to promote more conflict and prevent any kind of political cooperation between Palestinians and Israelis. In fact, many of these Christian Zionist groups are spending a lot of money and supporting various groups within Israel or within Israeli occupied territory, and the money that they’re spending usually goes to the most extreme and most violent groups because they’re trying to foment crisis and foment conflict as part of a theological perspective that Armageddon will come when there will be a great battle between Jews and Muslims, and then both sides will basically kill each other off and the Christians will win.For a lot of Israelis this is perfectly clear and the Israeli government understands that Mike Pence is not seeking their benefits. He’s seeking his own benefit and the benefit of his base. But the Israeli government is following very closely what’s happening in the United States in terms of the investigations against President Trump and the allegations and the possibility that Trump will be impeached. And they know that there is a good chance that Mike Pence will become the next president of the US, so they don’t want to alienate him at this point. So, of course, they’re praising everything he says. But even though there is so much praise from the Israeli government about moving the embassy, the Netanyahu government is not going to make any benefit out of it. SHARMINI PERIES: So Shir, that turmoil at the Knesset. What was that all about and who was protesting, and what were those flyers about? SHARMINI PERIES: Shir, are there any plans for Vice President Pence to meet with the Palestinian government as it is usually done when there is a dignitary visiting Israel in this way? SHIR HEVER: Pence wanted to meet with the Palestinian government but the Palestinian government decided to boycott Pence and I think that’s a very interesting development. We’ve never seen something like this where Mahmoud Abbas actually said he refuses to meet Pence. This is because of a lot of pressure coming from the ground from Palestinians who are very offended about Trump’s statement about the capital and by Pence’s statement about the embassy. And after Abbas announced that they no longer consider the US to be a fair moderator between the sides, then there’s no point in meeting with him to try to talk about negotiations because the United States cannot be trusted to take the Palestinian interests seriously.With Trump’s declaration that the US, not just a declaration, also an actual move to withdraw funds from UNRWA, from the main U.N. agency that supports Palestinian refugees. This was something that was seen as a very serious blow to Palestinians, a very vindictive act by President Trump. But we’ve just seen that Britain and Norway are stepping up and filling that gap, and they vowed to increase their funding of UNRWA to prevent a humanitarian catastrophe among Palestinian refugees. This actually makes the United States increasingly insignificant and unimportant in the peace process or whatever remains of the peace process. And it actually makes it a little bit more realistic for Palestinians to demand international recognition to level the playing field just a little bit, and that is actually something very hopeful. So, in terms of undermining plans of US politicians such as Mike Pence hoping to see more war in the region. SHARMINI PERIES: All right. Shir, I thank you so much for joining us today. 01/16/18 Why is Trump Targeting Palestinian Refugees?